The crystal on your favorite watch has become so scratched you can hardly read the time, what now? Don’t throw away your watch! 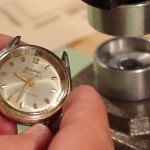 You can easily learn how to remove your damaged watch crystal with this guide. First, you need to open the watch case and remove all the important parts of the movement to avoid damaging them. Now that you have removed the inner workings of the watch, all that should be left is that watch case and the old crystal. Wrap your Selvyt cloth around the watch case so that you cover both sides of the crystal to protect your fingers. Turn the watch so that the back of the watch case is facing up toward the ceiling and hold the watch case so that your thumb presses down on the back of the watch crystal. Check that the cloth is still sitting between your fingers and the watch crystal, then apply pressure with your fingers to force the crystal out of the watch case. When the crystal pops out of the watch case, set it aside. 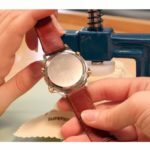 If your watch crystal cannot be easily pressed out by hand, you can learn How To Use a Crystal Press to Remove a Gasket or Tension Fit Crystal here. 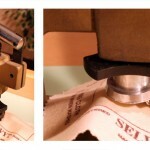 Now that you’ve removed the watch crystal, you can learn How to Reinsert and Attach your Watch Crystal with this guide. To learn more about other quick and easy watch repair tips, check out our Learning Center.